This is because while image volume is skyrocketing, how we use imagery is expanding. Not that long ago, the average person shared crude (by modern standards) snaps as prints or a slideshow with a few friends, and relived memories now and again by flipping through them. Reaching more than a handful of people with stills or video was almost exclusively the domain of serious enthusiasts and professionals. But not anymore. Today we use mobile devices to capture about 90% of images, and imaging has grown into part of everyone’s communication. We all reach thousands-plus on social media. We can post in (or almost in) real time whenever we want, and our images transcend “pictures” because they’re messages sent to people with whom we have personal ties – that’s what gets your images (and words) through the staggering numbers to get seen, and it doesn’t end there. On the receiving end, your friends see them almost immediately and when they’re interesting and/or compelling, they broaden who you reach by reposting to others with whom they have personal ties. So, our imagery reaches more people, and it is more powerful because it is a universal communication that conveys our experiences, visions and perspectives across national borders and language barriers. This is especially true for us divers. Thanks to its extraordinary ability to emotionally connect with the human experience of going into inner space, photography has always been close to the heart and soul of diving (the first underwater photos actually predate scuba). Today, divers easily snap images with color, sharpness and quality that the pros agonized to get in the 1960s and 70s. Applying these modern technologies to high end cameras and computer post-processing, today’s serious underwater shooters produce stills and video that were unimaginable, unimaginably difficult or even impossible two decades ago. All this means that whether you’re passionate about serious imagery, or just snapping casual shots (and we need both), your images have power. They can influence. You can use them to communicate with others about the oceans and underwater world at a time in history when it matters most. Stills and video of coral, kelp forests and reef-wrecks show that the underwater world is beautiful, worth experiencing and worth saving – we need these, but our messages must be wider. Ugly, but important, shots of dead/broken coral, adrift plastic, a litter-strewn beach or a sea lion drowned in a ghost net remind people that we have some urgent, serious problems that threaten life on Earth. Divers in an AWARE underwater clean up, restoring coral and staging a save-the-sharks outreach show that divers care and are doing something about these problems. Before-during-after dive moments with buddies, video of an Advanced Open Water Diver student triumphantly mastering navigation, and shots of a physically challenged person, an elderly person and a youngster diving together show that diving forges friendships, teaches us about ourselves, and embraces everyone. It’s often said that “a picture is worth a thousand words.” Whether it’s your mobile device, a mask-mounted GoPro or a pro-quality camera, as a diver your posted images can be worth more than that. The right image may be worth a thousand fewer kilos of plastic contaminating the seas. A thousand more sharks still alive. 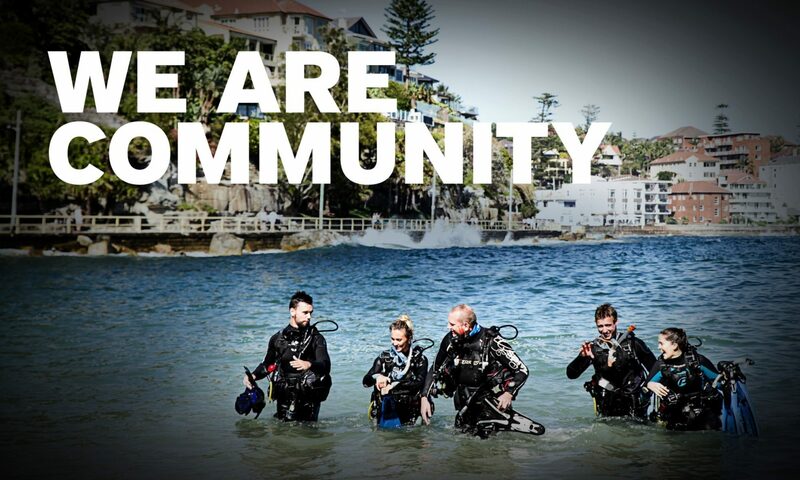 A thousand more divers shoulder-to-shoulder with us as the seas’ ambassadors and a force for good. So please, shoot, post and share. The world needs to see what you and I see.